Facing annihilation at the hands of the warlike Vogons is a curious time to have a craving for tea. It could only happen to the cosmically displaced Arthur Dent and his curious comrades in arms as they hurtle across space powered by pure improbabilityband desperately in search of a place to eat. Among Arthur's motley shipmates are Ford Prefect, a longtime friend and expert contributor to the Hitchhiker's Guide to the Galaxy; Zaphod Beeblebrox, the three-armed, two-headed ex-president of the galaxy; Tricia McMillan, a fellow Earth refugee who's gone native (her name is Trillian now); and Marvin, the moody android who suffers nothing and no one very gladly. Their destination? The ultimate hot spot for an evening of apocalyptic entertainment and fine dining, where the food (literally) speaks for itself. About a year ago, I picked up The Hitchhiker's Guide to the Galaxy for a third round - this time choosing to enjoy the audiobook because of the extremely talented narrator, Stephen Fry. And of course I loved it. What I find peculiar is the fact that I've never continued on in the story, so I thought that I would do something about that this year. 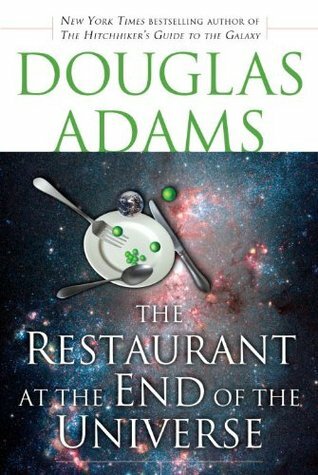 Much to my pleasure, The Restaurant at the End of the Universe is narrated by Martin Freeman...and it was awesome. Mostly. I had a little trouble following. I think it's going to take a second read. But I really did enjoy. From what I gather (I feel like many a summary starts this way...) we start off right where The Hitchhiker's Guide ends. Our motley crew have just left Margrathea, and The Heart of Gold is under attack by a Vogon ship. Unfortunately the Improbability Drive is out of commission because Arthur begged the computer to make him a legit cup of tea. Zaphod summons a ghostly relative who saves them, and Zaphod and Marvin find themselves at the office of the Hitchhiker's Guide in search of Zarniwoop (this dude who wants to discover who rules the universe). The crew bounces between the end of the universe and the beginning of Earth, Arthur and Ford unfortunately ending up on an "Ark" looking for a place to colonize with the most unfortunate of crews, and Zaphod and Trillian want nothing to do with the ruler of all. 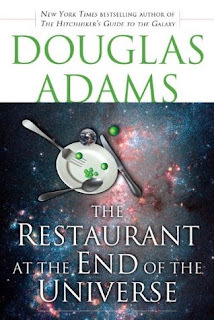 I love British humor, especially the sarcastic, witty, off-beat humor of Douglas Adams. And I love fun alien stories. And outer space. And Martin Freeman. Have I mentioned that yet? He's an excellent audiobook reader. And Watson. I love the part where the cow talks about how delicious he is!